Originally from Southern California, Austin has lived in so many different places that Fort Dodge has now become the place he’s stayed the longest since the 90’s. Austin received a B.A. in Psychology from Seattle Pacific University, in Seattle, Washington. Because Seattle didn’t have cold enough winters, Austin moved to Princeton, New Jersey, where he received his M.Div from Princeton Theological Seminary, and met his wife, Sara. The Mid Atlantic winters weren’t cold enough either, so he and Sara moved to Fort Dodge in 2009. Austin started his ordained ministry as the Associate Pastor for youth and young adults. In 2011, he became the Associate Pastor, picking up some responsibilities in addition to youth ministry. In 2013, he became the Senior Pastor for FPC. Austin has felt welcomed into this community from the day he arrived and feels called to help people in the community of Fort Dodge see the hope that we have through Jesus Christ. 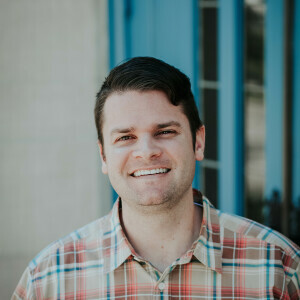 In June of 2017, Austin finished his Doctor of Ministry degree from Fuller Theology Seminary, studying Missional Leadership. It was an exciting and challenging experience, and he continues to implement what he learned from the degree in the community of Fort Dodge and within First Presbyterian Church. In Austin’s “free time,” he’s never bored. He’s been working on a science fiction novel for over 12 years, which you can check out at www.austindhill.com. In 2013 he earned his Private Pilot’s License, his instrument rating in the fall of 2016, and is currently a part of the Fort Dodge Flyers flying club. He also loves to read and play video games. In the midst of all this, Austin loves to live each day with his beautiful wife, Sara, and his ever-growing children, Lylah and Everett. Feel free to also follow him on Instagram: @hillaustind or by using the social buttons above.